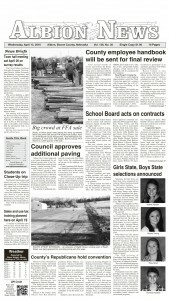 Big, big week for the Boone Central volleyball program. After defeating traditional Mid-State Conference power West Point Central Catholic for the first time in 12 years Thursday night, the Cardinals followed with the first championship in the history of their own Boone Central Invitational Saturday. Boone Central improved its 2008 record to 6-0 with the four match victories. “Thursday night, sweeping West Point CC, was the first time we defeated the Bluejays since 1996,” noted Cardinal Coach Erin Eickhoff. “It was a great night for the girls and just showed them they are capable of anything. Thursday’s match vs. West Point CC was never really in doubt from the outset as Boone Central combined strong serving runs, terrific defense and offensive efficiency to sweep the visitors 25-20, 25-23, 25-19. The Cards served at 95 percent efficiency (69-of-73) with 10 aces and returned serve at 91 percent to set up an attack that hit at an 85 percent clip (65-of-77) with 28 kills. Boone Central opened Saturday’s Invite with a 25-18, 25-14 victory over Creighton – again using strong serving and passing to dominate the match. Playing their toughest competition of the season to date, Boone Central rallied for hard-fought wins over Lakeview and Central City to take the tournament title. In a 21-25, 26-24, 25-21 win over the Viqueens, Boone Central served 64-of-68 (94%) and hit 82-of-92 (89%) with 32 kills. Setters were efficient at a 95 percent rate with 27 assists. 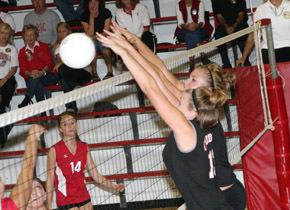 The Cardinals followed with a 12-25, 25-21, 25-19 championship victory over Central City. The Cards were again efficient serving (55-of-61, 90%) and hitting (51-of-63, 81%) while setters were nearly perfect (80-of-81, 23 assists).